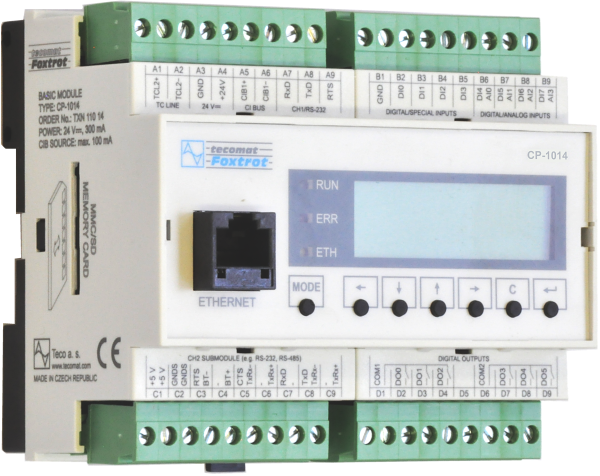 Foxtrot is based on modern and perspective Ethernet communication. 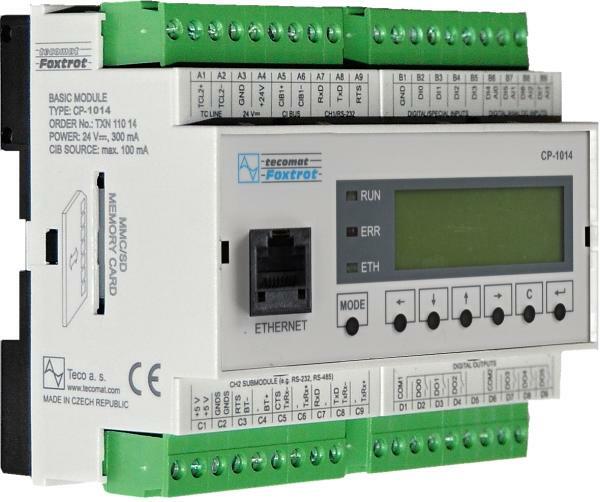 There is integrated FAST ETHERNET 100Mbit/s with RJ-45 connector and it enables direct integration of PLC Foxtrot into standard and industrial Ethernet network. 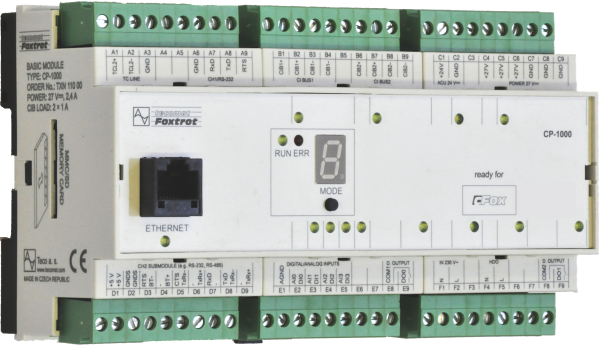 On this fast communication line Foxtrot holds up to 6 connections, for instance with software Mosaic, SCADA visualization system, OPC server, graphical touch panel and concurrently answers to 6 web clients questions to built-in web pages. 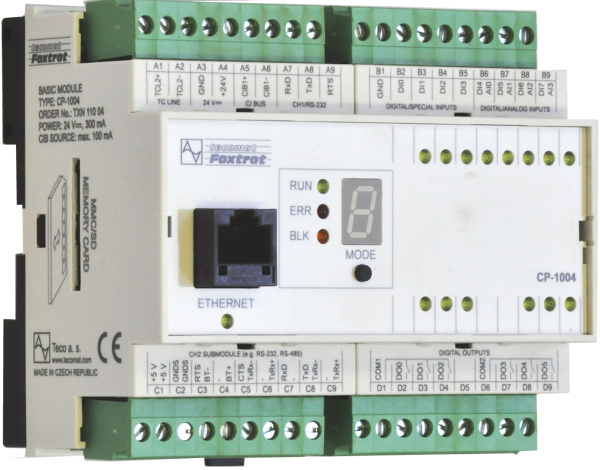 Foxtrot is perfectly designed to control intelligent electroinstallations and buildings. 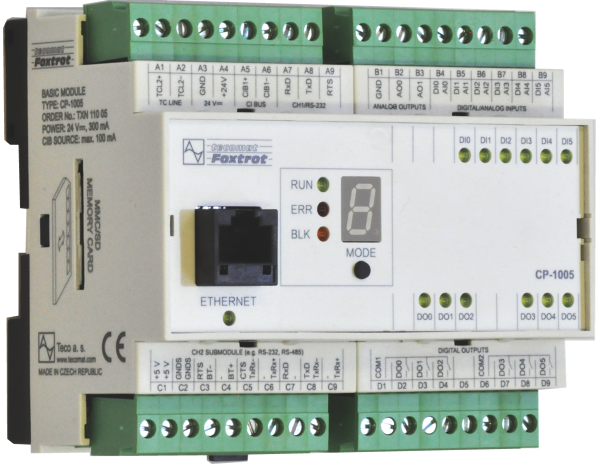 For this Foxtrot uses electroinstallation bus CIB – Common Installation Bus with guaranteed response between sensor and actuator to 150 ms. For this bus there is available still expanding amount of modules for interiors in the wall switch and sockets leading manufacturers designs, further modules for the installation into electroinstallation boxes, into lights and under covers of other device as well. 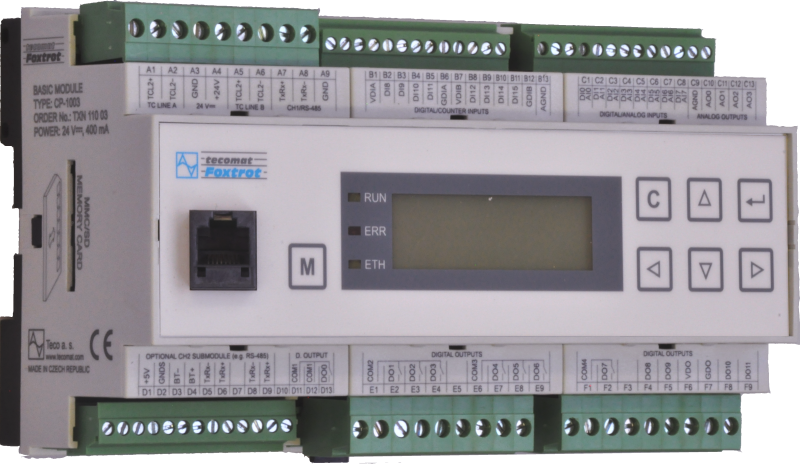 Finally there are modules for installation on DIN rail into switchboards like circuit breakers etc. There are two options how to connect Foxtrot into mobile network. 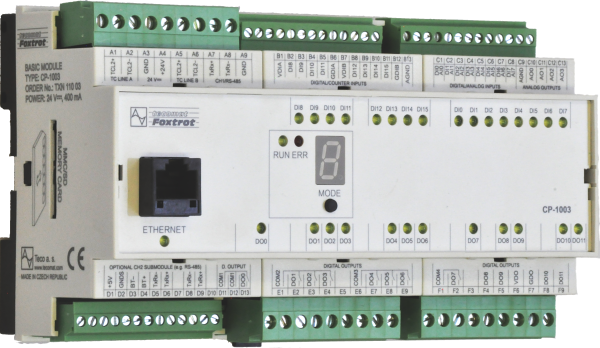 The traditional RS-232 connection is used for receiving and sending SMS messages or dial-up connection through AT commands. The progressive way uses GPRS/3G routers connected through Ethernet channel. It allows to use all Foxtrot’s tricks, going out of its abilities to communicate direct with IP protocols, like time synchronization with internet servers, direct SQL database storing , internal web pages providing, downloading fi les stored at high capacity SDHC/SD/MMC cards, sending reports via e-mail etc. 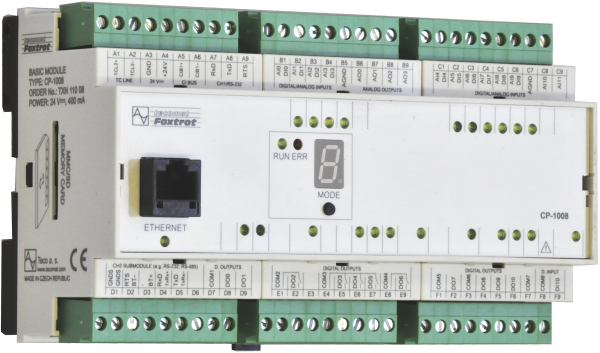 Foxtrot is ready to communicate on fast ethernet channel and this allows to connect Foxtrot with nontraditional operator interface – multimedia audio/video systems. One of them is Control 4, another one is Bang&Olufsen. These systems are usually called multiroom systems and allow us to control, choice and distribute audio/video signals from any source to any place. By its control means typical for audio/video they are able to control lights, temperature and safety systems in buildings. 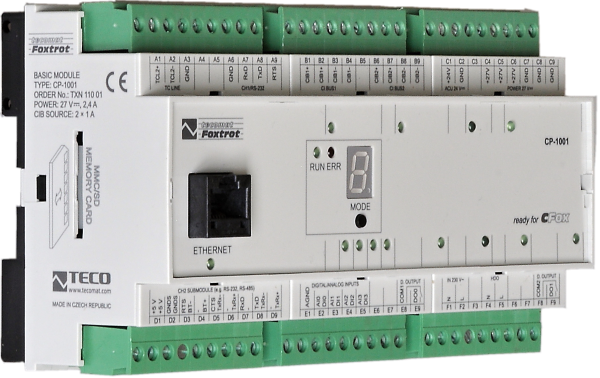 And just for these typical functions of electroinstallation, metering, control and electronic safety systems, multiroom systems use Foxtrot for the connection with each element in the building – switch, light, heater, detector etc. Integration of multisources heating systems, HVAC, energy metering and management, integration of electronic security systems, access systems - doors, gates, browsing. Perfect pbuilding process coordination. Optimalization of energy saving control. Comfortable programming and maintenance of applications via on-line programming during operation. Web interface for parametrization and mantenance. Removable flash memory card for data storing - data, recipes, web pages. Remote access. Power supply back up with external accumulators. System memory back up. Standardized metering ranges even with thermocouples. 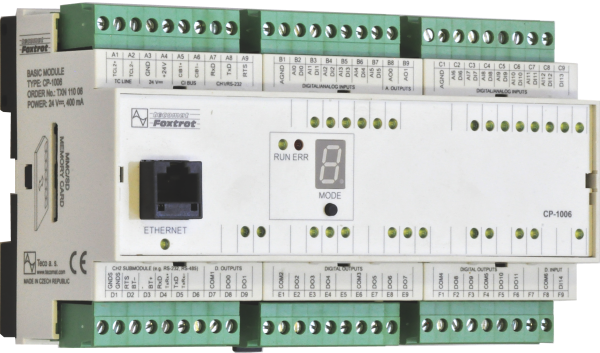 Decentralised I/O up to 1.700 m via optical fibre.